Welcome to BELLA COUTURE ® ! Celebrating over 15+ years of excellent customer service! Need help with an order? Our experts are available to assist you right now. Our 10-day money back guarantee gives you time to make sure your purchase is perfect. If you need to return an item for any reason, we'll happily provide you with an exchange or a full refund if the item is returned within 10 days of your delivery date. Due to every item being hand crafted after payment each order is considered a special order. Special orders are custom designs and cannot be returned for a refund after 10 days as our fine jewelry vendors will not accept returns after 10 days. Any item returned after 10 days will be returned to sender at the buyers expense. Enjoy risk free returns within 10 days of delivery. • How do I return an order? • Are there some items that cannot be returned? • Can I return or resize an item I had engraved? • How long does it take for a credit to process? • Who pays for return shipping? Your complete satisfaction with Bella Couture®, LLC merchandise is 100% guaranteed or the item may be returned or exchanged within fourteen days from when it was shipped, with a Return Merchandise Authorization. You will only pay for return fees and your return's shipping insurance fees. To receive a Return Merchandise Authorization code on orders shipped within the United States contact us. Please note eligible returns must be in their original purchased condition, include all product documentation (ie: tags intact, gift box, gift bag etc. ), and shipped within 10 days. To expedite an exchange for a different item, we recommend returning for refund and placing a new order or contacting us to HOLD the item you want instead. Most items we sell are either one-of-a-kind or of a very Limited Edition. Please allow approximately 1-2 weeks for your refund to be processed. If a package or item delivered to you arrives damaged, please make sure you refuse the shipment or call us immediately at 1-877-235-5297 and do not accept the item or you will be responsible for its content's condition. Please retain all packing materials unless instructed otherwise by Bella Couture®. Claims for damaged items must be reported immediately within 24 hours of the 1st attempted delivery of your order. All orders are video taped during the packaging process to ensure you are receiving the exact item's ordered and that they are of the finest quality. For this reason Bella Couture® will not be responsible for claims of missing parts, lost or damaged returned shipments. Returns are video taped to ensure the item returned is in the same exact condition as it was shipped to you. Returns are processed during weekdays once an item has been received at our Returns & Exchanges Fulfillment Center. Following receipt of your return, you'll receive a confirmation email letting you know your return was received. Please allow an average of 1-2 weeks for full processing. Our Bella Couture® Quality Assurance department will review and grade the returned item. Items that show any signs of wear or items that have been altered, resized (by a jeweler other than Bella Couture®, LLC), or items that are damaged cannot be accepted for return. Please allow 10-30 days after processing for your bank or card to post credit towards your account. 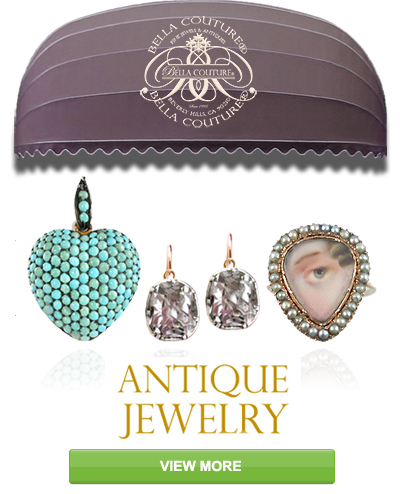 Unaltered, New and Antique Fine Jewelry and Antiques returned to us within 5 days of delivery can be exchanged for FREE. Once you return the original item and have decided on your exchange / replacement item, your new order will be shipped to you at our expense. Special Order Bella Couture® engraved rings may be returned for resizing only, and are not exchangeable. Engraved jewelry merchandise may not be returned. 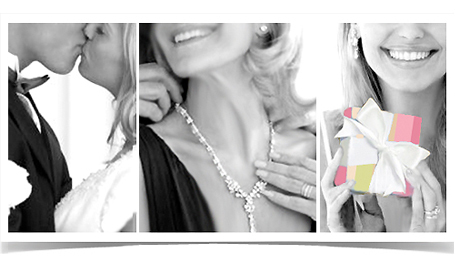 Diamonds purchased as part of our Bella Couture® Red Box or Black Box Diamond Program may not be returned for credit. Special orders are a final sale and are not eligible for return. Returns without a Bella Couture® return code, returns sent C.O.D., and improperly or uninsured packages will be refused upon receipt. Returns with missing paperwork or product will not be processed. Gifted items not returned by the original purchaser are non-returnable. All international sales are final sales and are not eligible for return. For all returns call 1-877-235-5297 and you will be given a Return Authorization Code. For your return, write your RMA code on the outside of the box you are returning below your address. Please note, an item returned without an RMA code will be refused. Packaging Your Return: We recommend you use the original or a similar shipping box, include all original packaging and collateral materials. Items returned without the entire contents will not be processed until the additional contents are returned. If your item was delivered with a diamond certificate and that certificate is not returned, you will be liable for the US$275 (or equivalent amount in other currencies) replacement cost. For security reasons, do not write Bella Couture® anywhere on the outside of the box. Insure Your Package: We recommend you securely package your return in it's original packing materials, fully insured. We are not responsible for lost or stolen returned articles that your selected carrier causes. PayPal orders can be returned for credit back to your PayPal account. Please allow up to 1-2 weeks for your account to be credited. Shipping charges, including Special Handling and any other related costs, are non-refundable. Bella Couture® will not reimburse you for return shipping expenses incurred. If you request to return for alteration merchandise which is of a special order, we may reimburse you for full or partial return shipping expenses our discretion. We will not reimburse you for overnight, express or other special services used at your discretion. Once your order ships you will receive an automatic shipping confirmation the day of the outbound shipment. You can track the status of your order on your My Account page or by clicking here. Thank you for shopping at Bella Couture®, LLC. 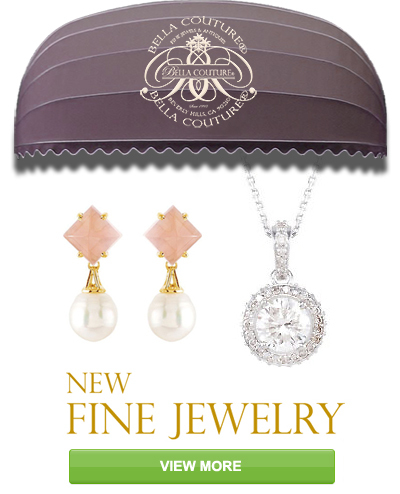 If you have any questions about your return, please call a Bella Couture® Diamond & Jewelry Consultant at 1-877-235-5297 • 1-877-BELLA-97. Customized Orders are not returnable for any reason. Credit card and PayPal® purchases will be refunded towards the credit card or account used in the original purchase. Please allow up to 1-2 weeks from the date that Bella Couture® has received your return for your account to be credited. Your credit card company's refund posting guidelines may vary. Sale price adjustments cannot be made after a sale. Prices are subject to change without notice. Can I Cancel or Change an Order? If you would like to change or cancel an order please call a Bella Couture® Diamond, Jewelry or Antique Consultant at 1-877-235-5297. We will do our best to try to accommodate order changes to the extent in which it is possible prior to a shipping confirmation. Changes in orders may result in a shipping delay. We are unable to accommodate changes or cancellations on orders that have already shipped or special orders. If your order has already shipped the order will not be able to be altered. Check the status of your returned item on your My Account page or by clicking here. Be the first to know about New Arrivals! © BELLA COUTURE ® .